Dave Hughes shares the secrets he's learned over a lifetime of fishing nymphs in both streams and stillwaters. Listen in to hear how he makes fishing with nymphs simple, direct and effective. There isn’t a better feeling than to catch a trophy trout while basking under the gentle heat of the morning sun fly fishing in one the best streams or stillwaters in your area. It’s one of those moments that your heart swells with pride even if no one’s around to see it except Mother Nature. Among other factors, the right choice of nymphs is one of the determinants in making this happy fly fishing dream a reality. Insects that have a larvae and pupae stage are insects that have complete metamorphosis, Dave says that nymphs don’t have a complete metamorphosis. “They go right straight from the nymph stage to the adult.” He added that nymphs look very similar to the adult. “You add wings, you’ve got the adults essentially.” Dave sites mayflies and stoneflies as examples. In fly fishing terms, Dave defines nymphs as fly patterns that represent the larval, pupal, or the nymph stage of an insect or creature that goes underwater. To cut it short, Ed Angle puts it as “nymph imitation”. “They can represent leeches, slugs, scuttle bugs, and aquatic scuttle bugs,” commented Dave. Although nymphs are predominantly for trout fishing, Dave says that they can also be extremely effective for small mouth bass. “I went small mouth fishing and the fish just hammered them. They really were more effective than the streamers I typically use or the poppers,” he says. 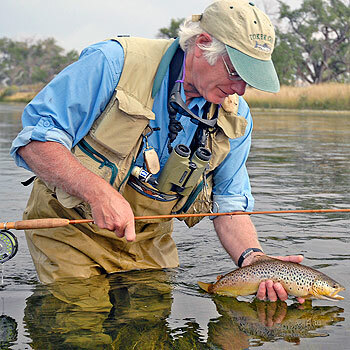 As an observation from his past fly-fishing experiences, he says that the water temperature does not necessarily affect what nymph he will use. “I don’t think your nymph selection is based on water temperature. It’s more based on what I collect from the stream and making sure I have something on there that’s small. What I find in the stream would affect it.” He says that if the temperature is cold, he would make sure that he has a very small fly on. A size 14, 16, or 18 combination would be ideal. The most critical mistake an average angler has to make when fishing nymphs in streams, according to Dave, is not getting deep enough. “If you’re not getting your nymph on the bottom or within a few inches of it, then that’s the biggest mistake because you won’t be catching fish,” he says. Western lakes and reservoirs have large chirominids, Callibeatis, scuds, damsels, and midges which are essentially the bread and butter nymphs for stillwaters. “All the literature on midge fishing comes out of Canada because the midges are bigger up there; if they’re bigger, they are easier to fish and more important,” Dave says. However, he says, “What you’ve got to realize is that the insects are pretty much the same in all the lakes, but they are not all the same sizes. If you reduce the sizes of what those folks are talking about, it’s going to work for you very well.” Dave usually takes the stuff that they pioneered in Canada but he uses smaller nymphs instead. Learn more by listening to our complete 90 minute interview Nymphs for Streams and Stillwaters with Dave Hughes.